And I Giovanni consider that 'The City Library' ... are the Heart of Culture of the City, Town, Country, School or University. We at Future Technologies have engineered an impressive accumulation of books ... to improve Education, Culture, Wisdom and Love ... and then if you have Wisdom and Love you shall have Power. The Path of the Right Side ... is the Path of the Heart ... the Path of Lord Jesus, the Path of Wisdom, the Path of Life and the Path of Balanced persons. The Path of the Left Side ... is the Path of the Violence ... the Path of the Dark Lords ... considering Technology is the Construction of Weapons ... to enslave ... everyone and then ask money ... and then give some cents to live. The Dark Side. There are no other sides. Just Two. Must be understood that both sides are present on Gaia (planet Earth) ... but the Tribes of Gaia ... The people of the North, the people of the South, the People of East and the People of the West ... do not yet spoke ... not yet. Time proceed ... The planet ascend the Spiral ... and we walk into a New Time. Is a New Time from different perspectives. We have the Aquarian Age ... we are into that Age. It is New ... can be Golden ... can be Darkness. Most people work to let it become 'A New Golden Age'. We have the Water Cycle ... We have the Ascension of Earth ... we have the Change of Polarization in the Sun and the Earth ... and we have few Lightworkers ... some still not in perfect Harmony as expected in Heaven ... but Heaven is Heaven ... and is only for the Holy ... not for the Dark Ones. One of the New Roles of Lord Jesus is to be (also) the Librarian of the Library of Alcyone ... in the Pleiades. You can accept it ... Metaphorically ... (You can read also Page 212 in 'The Pleiadian Agenda'). 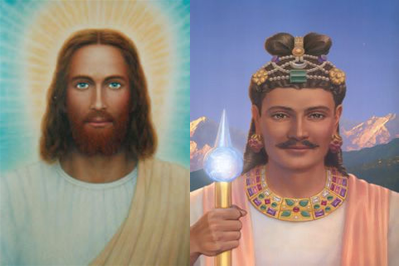 Lord Maitreya (Lord Jesus Twin brother) and Lord of the Divine Mathematics, Dance and Music ... invite us to create a New Educational Protocol for the 21th Century. We call this Project: FTHumanEvolutionCourse ... A course for Enlightenment. ... to Physics, to Chemistry, to Spirituality, to English and Shakespeare ... to World Languages like Spanish, Italian, Chinese, German, French ... Arabic, Russian, Japanese ... all languages ... to World's Religions, to Humanities ... up to Agriculture ... to Biology and DNA ... to Alchemy ... to Unite ... The Cultures of the World ... for the World.